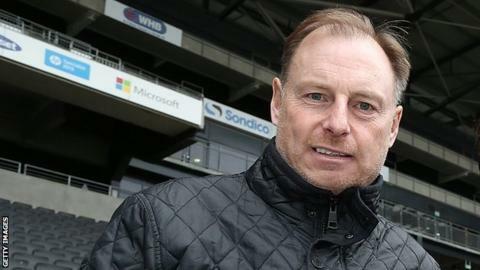 Port Vale assistant manager Paul Bodin says there is "not a lot wrong" with the side at the moment despite their four-game winless run in League One. Vale are 17th in the table, three points above the relegation zone, after taking one point from the last 12. "We're all desperate to get a win," Bodin, 50, told BBC Radio Stoke. "There's still confidence amongst the players and staff. There's not an awful lot wrong with the team - just little details and one or two injuries." Vale are still waiting to hear the extent of winger Enoch Andoh's injury, after he hurt his knee in the defeat by Colchester on 20 October. But they are hopeful two of the the club's other wide players - Chris Birchall (thigh) and Byron Moore (groin) - will be fit for Saturday's home game with Shrewsbury. Striker Uche Ikpeazu is suspended after his red card in Saturday's 2-0 loss at Burton and it has left Vale looking at the possibility of bringing some cover in on loan. "There's always that possibility if the right player became available," former Wales international Bodin added. "But any proven goalscorer is going to be in his club's first team - so it probably wouldn't be someone like that. "I think we've got enough talent in the squad. It's just a question of someone stepping up."